Spiders are at once one of the most feared — yet beneficial and misunderstood — and studied animal in the world. Legend suggests that the mere sighting of a spider brings good luck for the day, and many cultures adhere to the myth that killing a spider will bring seriously bad luck. Not only are spiders beneficial, they can also provide unparalleled educational opportunities. Just watching a determined spider construct a web and catch prey can be an inspiring study in perseverance and engineering. Studying the effects of spider webs strung across pathways can provide hours of solid entertainment, along with insight into lunatic behaviors of weaker minded individuals in our society. Case in point: I have discovered that there is such a thing called a “web-face dance.” It is often performed on a trail in the woods during late summer or fall but can occur in any random location, such as an alleyway between out-buildings or a door threshold if the door has been left open for a while. The dance is always performed solo, and if several people are walking together, it is always performed by the lead person, much to the delight of the rest of the group. My son-in-law did not invent this lively dance but he has certainly perfected it. It occurs without warning. I have attempted to break down the specific choreography, but because the tempo is so fast it is a blur, and without slow-motion video capability, it’s difficult to separate his specific steps. I can only generally describe them as follows: The web-dance appears to be initiated when his feet realize that his face has planted, or is about to plant itself, into a dreaded spider web. His head and upper body freeze in midair and actually begin backtracking. This move is quickly followed by a burst of very rapid backpedaling footsteps coupled with wild flailing of hands and arms, pawing and clawing at the face and ears while filling the air with karate chops. Hat, glasses and anything he is carrying go flying. The silver lining to my son-in-law doing a web-face dance is that witnesses are treated to an unforgettable, hilarious spectacle and are seldom able to control waves of convulsive laughter. What triggers this dance and how can it be controlled? Medical research indicates that a web-face dance is strictly a reflex action, no conscious thought involved. The futile flailing of arms and legs was once thought to both ward off any lurking spider and simultaneously free oneself of the sticky webbing across the face. In truth, it does neither. It is all to no avail. There is no removing the web. It is too sticky and near invisible. At the same time, if the spider has a chance, it will sense that a human is bigger prey than it is willing to take on and will retreat. But occasionally the spider is caught in the melee and is transferred to the dancer’s person. This results in even more foreign vocabulary and frantic brushing and clawing of the face, hair and head region. Even after removal, the very thought of the incident elicits impulsive behaviors of brushing fingers through hair and rubbing the face – which continues sporadically until quieted by a hot soapy shower or until the following weekend, whichever comes first. In most cases, the net result is that no harm occurs to a person who bumps, even face first, into a spider web – discounting the humiliation of having performed the web-face dance in public. Chalk it up to living in the Midwest. It is the price that must be paid as a hiker, biker, jogger, homeowner, gardener or outdoor enthusiast. There ARE risks involved with exploring nature. Boldly going where no man has gone before exacts a price. Spider web-induced dancing is one cost. Over 30,000 species of spiders have been described worldwide. While my son-in-law asserts that virtually every one of them has made a web on the very trail he is hiking, such is really not the case. Only about 3,000 species occur in the United States, and only about one third of those species construct webs. Even so, that still leaves plenty of spiders to torment trail blazers. Web-making spiders come in all sizes, shapes and colors. Some appear to be large enough to capture big birds, medium-size mammals and even small children. Others are very tiny, as small as 1/20th of an inch in length. Each group of spiders has a unique life history and behavior. Some of the most unusual and colorful spiders, common in yards near homes at this time of year, are the orb-weaving spiders. Orb-weavers, often called garden spiders, weave an elaborate web to ensnare their prey. Such webs are perfect displays of biological architecture. Spider webbing (silk) is one of the most amazing materials known to man. Different silks are made for different spider purposes, but in general they all begin as a liquid composed primarily of proteins produced in the silk glands within the spider’s abdomen. The liquid silk is drawn out of the spinnerets at the rear-end of the abdomen and then hardens to form the silken thread upon which the web is formed. This process then allows for small liquid globules to be strategically placed by the spider in the web. These droplets are not stretched into strands, thus remain liquid and therefore sticky. The hardened webbing together with the sticky droplets are what catches the insect prey and are also what elicits the web-face dance in humans. It has long been known that spider silk contains remarkable mechanical properties in terms of strength, resilience and flexibility. Pound for pound, natural spider silk is 35 times as tough (amount of energy per unit volume that a material can absorb before rupturing) and has a tensile strength (ability to stretch without breaking) of four times that of steel. This means that spider silk, based on weight, can absorb more than 100 times the impact of a .357 caliber bullet and could actually stop a moving train in its tracks. 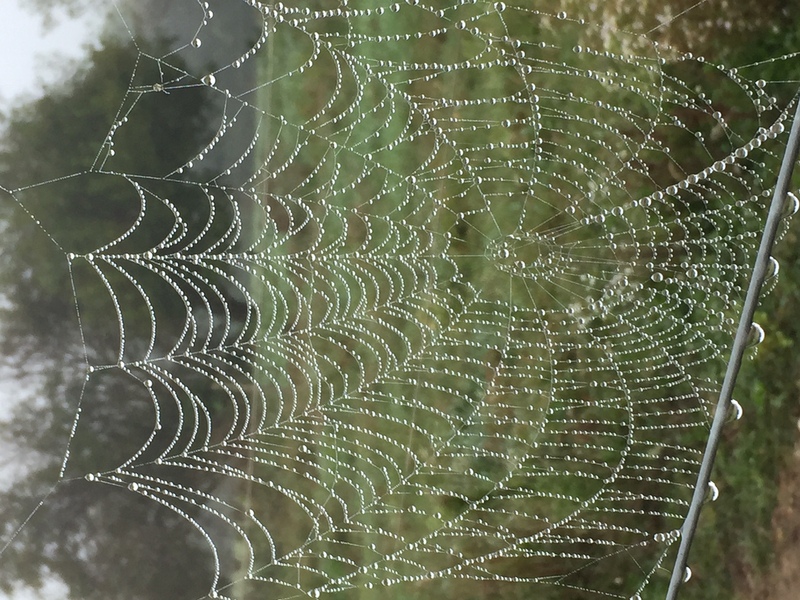 While the superior properties of spider silks are well known, as of yet there has been no way to produce spider silk in commercial quantities, and obtaining sufficient quantities of the material by collecting existing webs has been problematic. My uncooperative son-in-law is unwilling to intentionally plow head-first into spider webs and wait until people peel the sticky material from his face and ears – even for the sake of science. In addition, spider silk is a famously light material; a strand of spider silk long enough to wrap around the world would weigh less than 18 ounces. Think of the number of web-face dances required to harvest even an ounce of spider webbing. Rearing spiders en masse and harvesting their silk is also stymied, mostly because spiders are cannibalistic – they do not do well in groups. To solve these problems, genetic engineering technologies are being explored. By genetically engineering spider silk-making genes into an organism which is already one of the most efficient commercial producers of silk — the domesticated silkworm — large quantities of spider silk may, in theory, be produced. We use the term genetically engineered spider silk instead of synthetic spider silk because these materials are not synthetic; they are made by genetically engineered silkworms, and the fiber is composed entirely of protein produced naturally by the silkworm. They are synthetic spider silks only in the sense that they are not being produced by a spider, but by a much more efficient organism. If one gets past the annoyance (think web-face dance) to take a close look at spiders, it quickly becomes apparent that spiders are truly fascinating and beneficial creatures. They are masters at catching insects, including mosquitoes, in their webs. There is no doubt that spiders account for significant insect control. True, there are some (very few) spiders, such as brown recluse and black widow, that have dangerous bites. In reality, however, the vast majority of spiders are not only harmless but are, in fact, beneficial. Finding them in a yard is a good thing. It means that the yard is a healthy environment. Therefore, in nature, spiders should be left alone to do their thing. What little inconvenience they cause is more than made up for by the good that they do. Remember too that their annoyance is temporary. Spiders generally do not live past the fall. Don’t be first on the trail. Kick back, let someone else clear the trail, or, when traveling in a group, let the tallest dimwit go first.